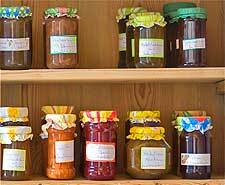 For many people, jam making is as much a passion as it is a hobby. This is a great way to preserve seasonal fruit and enjoy it for the whole year, while some avid jam-makers simply enjoy gifting their decorated jars as thoughtful presents. 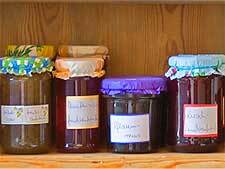 There are certainly a number of big advantages when you compare homemade jams with their equivalent shop-bought commercial versions. When you make it yourself, you know exactly what you are putting in the jar and how pure your ingredients are to start with - no unknown additives, artificial colours, preservatives or possible traces of pesticides. It is fair to say that hand-made jams tend to use higher quality ingredients, although when made on a fairly large scale, this can actually still prove to be quite economical. If you are gathering fruit (or vegetables) from your own garden or a hedgerow, then the costs are further reduced to just a little extra time. The process of preserving fruit in this way dates back many centuries and historians widely believe that the history of jam making in Europe can be traced all the way back to the latter part of the Middle Ages, namely the 16th century. Fruit preserves were initially considered to be something of a luxury and savoured by the wealthy, due to the high price of sugar. In Paris, King Louis XIV is known to have had a particularly sweet tooth and at the end of his royal feasts in the Palace of Versailles, jams made with fruit from his ornate gardens were regularly served up on elaborate silver platters. There are a number of old-fashioned recipes that show the evolution of jam over the years, with not only the proportions of fruit and sugar changing, but also the actual fruit itself. Staple ingredients of early British jams during the Tudor period were common medlar fruit (similar to apples in flavour) and quince. Popular recipes from the Victorian period often incorporated more exotic and highly prized fruit, such as apricots, bananas, lemons, melons, pineapples, pomegranates, oranges and tangerines, as well as more widely available blackberries, damsons, elderberries, gooseberries, prunes, raspberries, rhubarb, rowan berries (mountain ash) and strawberries. 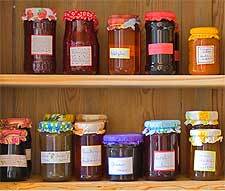 Basically nothing more than a simple way to preserve fruit, jam is best made by using only tried and tested recipes, unless you enjoy experimenting with flavours. By boiling the fruit, a natural soluble, somewhat gelatinous setting agent known as 'pectin' is released, together with natural acids. When the fruit is boiled with sugar for a fixed period of time and finally reaches 'setting point' (104°C / 220°F), a 'jam' mixture is created that will set once cooled down. Whilst a commercial version of pectin is available, its inclusion is not usually necessary if you follow a recipe carefully and do not rush the whole process. However, some particularly watery and low-pectin fruits such as rhubarb and pears may benefit from the addition of some extra pectin (e.g. from apples, currants, damsons, grapes, plums and redcurrants), and so this may be as simple as mixing in a different type of fruit. We have compiled around 150 different recipes for jams, savoury jams (chutneys), curds, marmalades, preserves and jellies, ready to assist and inspire you in your fruity culinary endeavours.